BOSTON, Nov. 14, 2016 /PRNewswire/ -- If you're a fan of the television show "Shark Tank", you won't want to miss the episode that airs this Friday, November 18th 9:00-10:01 p.m. EST on ABC Television Network, when Catharine Arnston, Founder/CEO of Boston's ENERGYbits® makes her pitch. Will the Sharks eat her alive? Tune in Friday to find out. ENERGYbits® won their coveted spot on "Shark Tank" by beating out 40,000 other entrepreneurs. The competition is stiff since "Shark Tank" has become the most watched television show on Friday nights, averaging 10 million viewers per episode. ENERGYbits® pitches their plant-based, high protein algae tablets to the Sharks as the easiest, most natural way for health-conscious consumers and athletes to improve energy, hunger and health without caffeine, chemicals or sugar. And all for just one calorie. Algae is a multibillion dollar industry in Asia where tens of millions have taken it every day for the last fifty years. And for good reason. Algae's nutritional profile of forty nutrients, Omega-3 and sixty-four percent protein is unrivalled. In fact, both NASA and United Nations endorse algae as the most nutrient dense food in the world yet it remains virtually unknown in the USA. ENERGYbits® wants to change this. Six years ago they started educating consumers and athletes about algae's benefits and call their tablets "bits" because they are "dried bits of food" like raisins, nuts or kale chips. Their bits are organically grown, have just one ingredient and one calorie and contain forty vitamins/minerals, more protein than steak, more antioxidants than cherries, more iron than spinach, more beta carotene than carrots and more calcium than milk. And that's just for starters. Athletes, executives and busy consumers are amazed by the mental, physical and athletic performance improvements they get from ENERGYbits® spirulina and the rapid recovery and health benefits they get from RECOVERYbits® chlorella. All this from an eco-friendly, sustainable food crop that contains no caffeine, chemicals, gluten or sugar. As Catharine Arnston, Founder and CEO explains, "ENERGYbits® are 100% spirulina, an algae that satisfies hunger; provides a steady stream of energy; and improves endurance, strength and mental focus . RECOVERYbits® are 100% chlorella, an algae that provides rapid recovery; repairs muscles; removes toxins; slows the aging process and builds the immune system, all without chemicals, sugar, caffeine, gluten or stomach distress." The attraction of ENERGYbits® protein-rich, low calorie, green nutrition is undeniable. In just seconds as you dash to work or the gym, swallowing a handful of ENERGYbits® will jump-start your nutrition and energy needs for the day. They're also a great alternative to greens, cooking, or caffeine and an easy snack to take on the road or on the run. No wonder sixty Olympic and pro-athletes endorse them and in 2015 they won a national award from Entrepreneur Magazine. Will the "Sharks" take the bite and put their money into bits? Tune in this Friday, November 18 at 9 pm/ET to find out. Either way, you'll learn what insiders already know - that ENERGYbits® are a game changer for your hunger, your health, your energy, and maybe even the world. ENERGYbits® Inc. is a six year old plant-based nutrition company based in Boston MA. 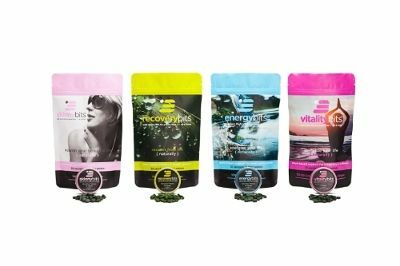 ENERGYbits sell four brands of algae tabs to athletes, teams, fitness enthusiasts, wellness professionals and health conscious consumers. For more information or to purchase yours visit www.energybits.com.